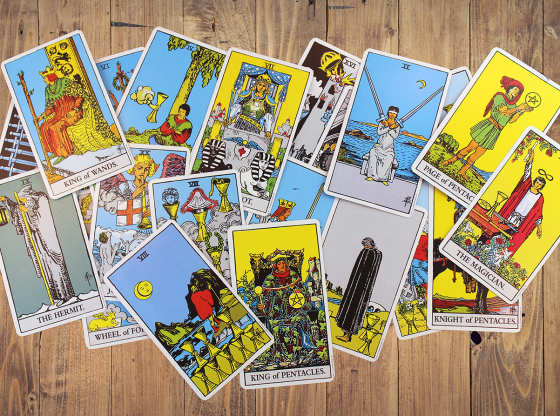 As we’ve seen, the early history of the tarot was an intricate tapestry that often wove fact with fallacy. 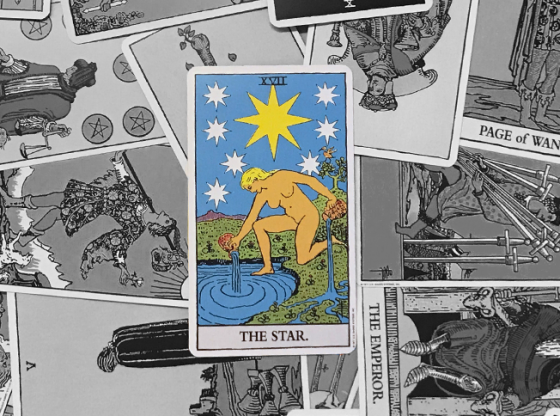 Many of the very elements that appear to make up the history were actually fabricated, meant to add to the tarot’s mystique. 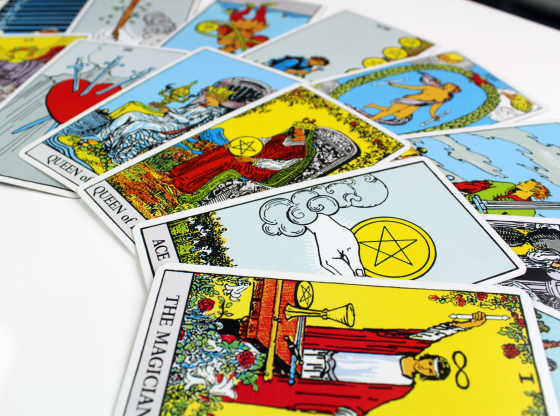 The intentional introduction of fictitious ties with ancient mystical cultures was strategically leveraged to heighten the cards’ allure. 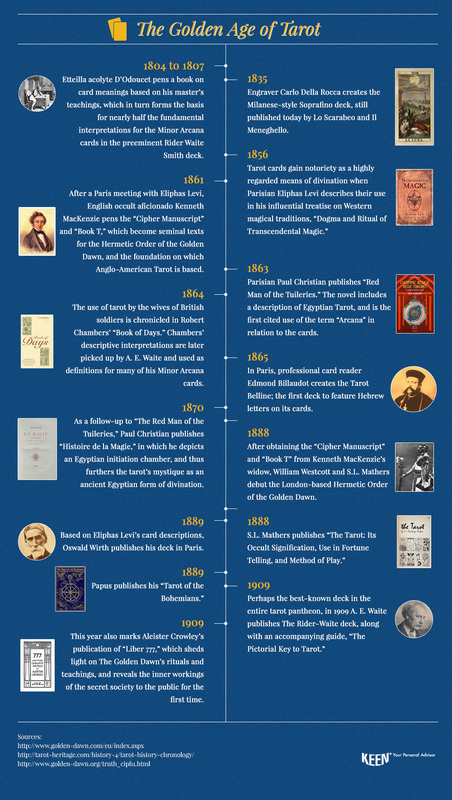 Such false histories had such a powerful appeal, however, they were oftentimes consumed verbatim, and relied upon by many as truth. 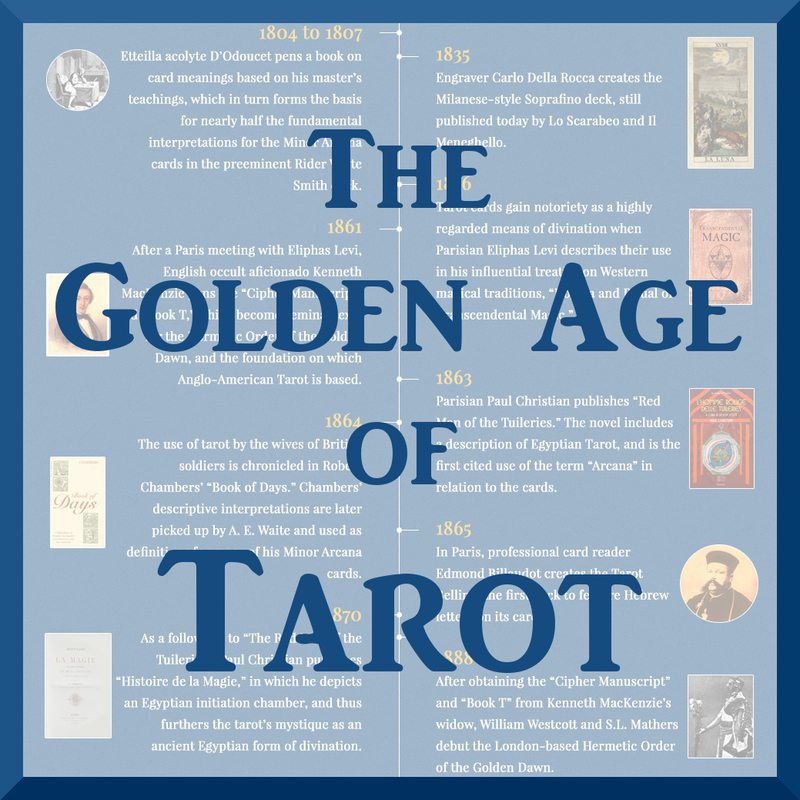 At the end of the 18th Century, Etteilla introduced the first occult deck, now known as Le Grand Etteilla, featuring Hermetic teachings, and setting the stage for a golden age in which forward thinkers and famed occultists—such as Kenneth MacKenzie, William Westcott, S.L. 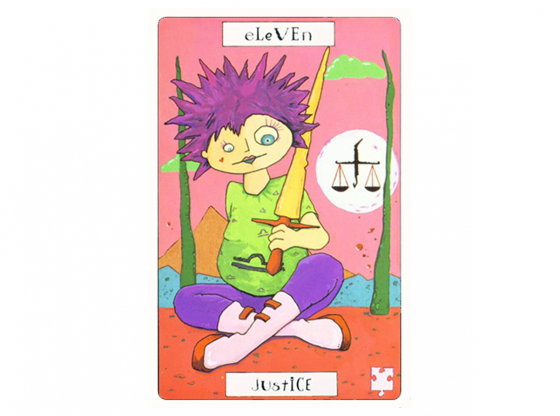 Mathers, and later, A.E. 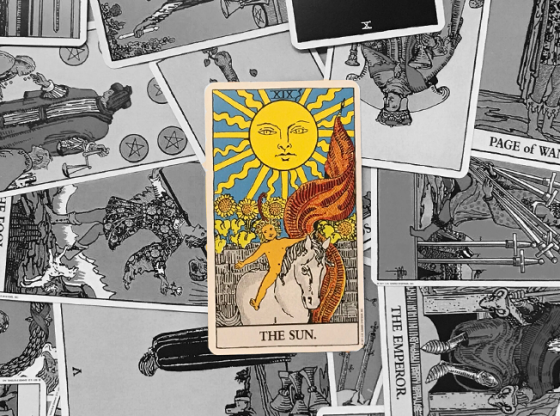 Waite and Aleister Crowley—guide the tarot back to its true historical origins, while at the same time elevating the cards to an unprecedented level of status and acceptance, that reached its peak in the early days of the 20th Century. 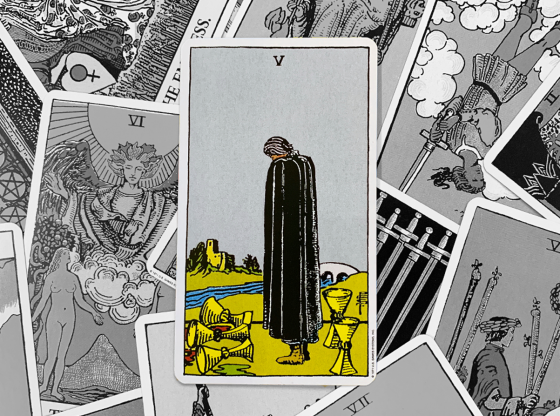 Our timeline of strategic tarot events continues here. 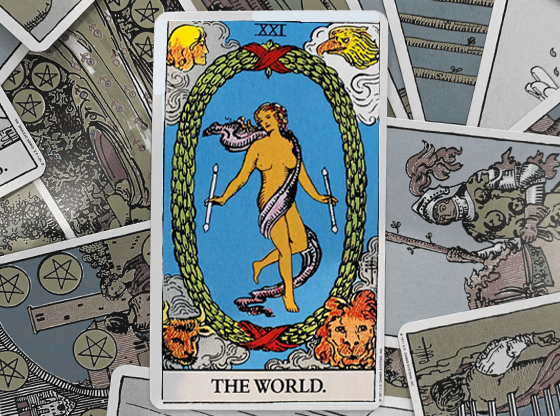 While the tarot maintained its popularity as the 19th Century came to an end, science was fast becoming the ruling “faith” of the 20th Century and the modern world. 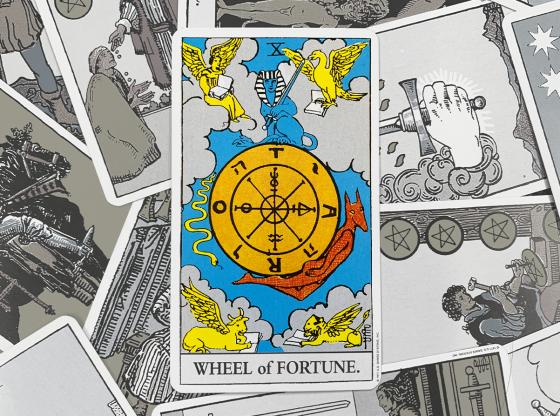 As a result, many occult pursuits, for which there was no statistical or verifiable data, began to fall out of public favor. 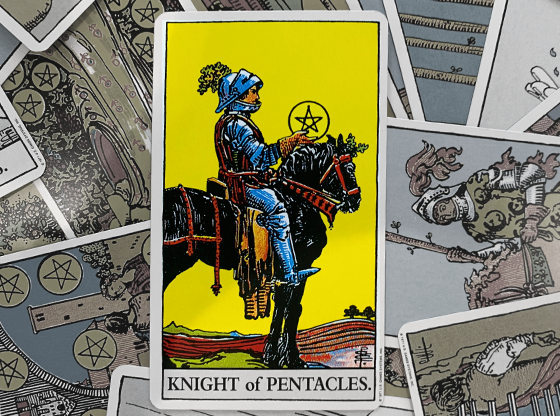 Still, there were those whose fervor for the cards and their teachings continued to move ahead, advancing both the art of the tarot and the craft of reading cards. The ensuing decades would engender a raft of new spiritual organizations, such as the Builders of The Adytum (B.O.T.A.) 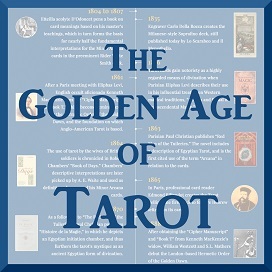 and Society of Inner Light; stunning original tarot illustrations by renowned artists including Londoner Lady Frieda Harris, and an array of tarot-related literature that assured the cards a place, if not in the mainstream of culture, one that was at least never far from the reach of those whose hearts and minds sought out sources of psychic solace and intuitive information to aid them in their quest for self-actualization and deeper knowledge. 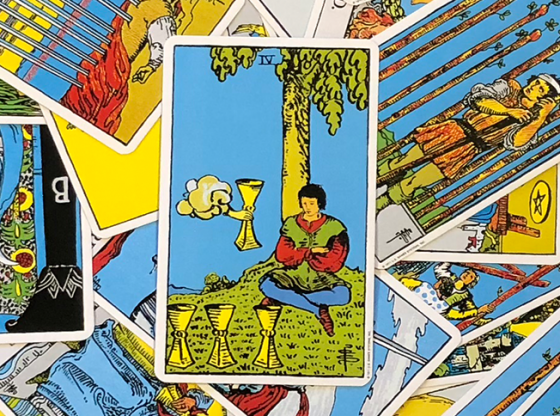 If you’re seeking a deeper connection to your own personal history, let a KEEN tarot advisor put you truly in touch with your past, present, and future.